From the southwest of Germany, pilgrims have several options to travel to Santiago de Compostela. This Jakobsweg between Breisach and Cluny connects the Alsace to Burgundy. The start is in Germany, Breisach, near Freiburg. Soon, the Way crosses the Rhine and heads for Couthenans, Gy, Beaune and Cluny. By the way: you will pass the best vineyards of France. From Cluny, it is another 250 km or 10 days walk to Le Puy-en-Velay, The first part is not very clearly described, but halfway one hits the GR65 or Via Gebennensis coming from Geneva. Overview of this Way of Saint James between Germany and France. 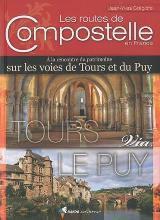 Peter Robins' ultimate reference website "The Walking Pilgrim".The part between Cluny and Le Puy.